Download "137. 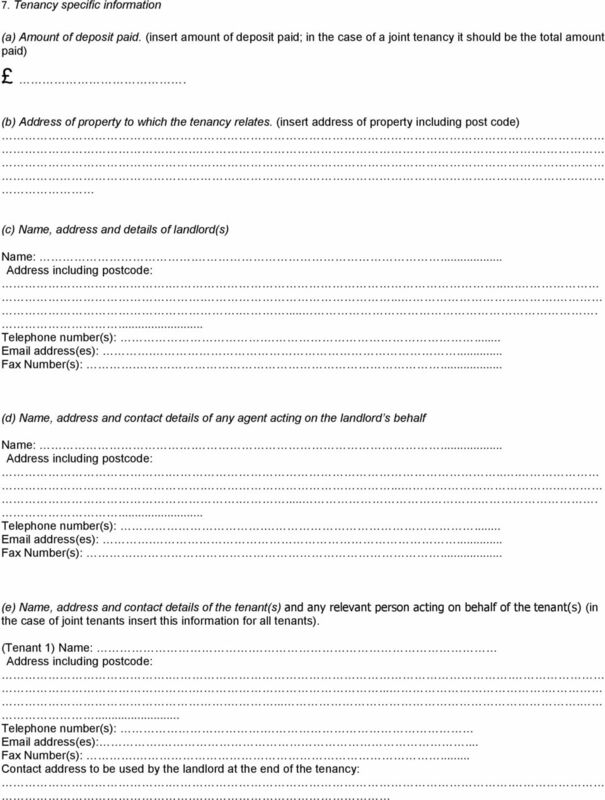 Tenancy specific information (a) Amount of deposit paid. 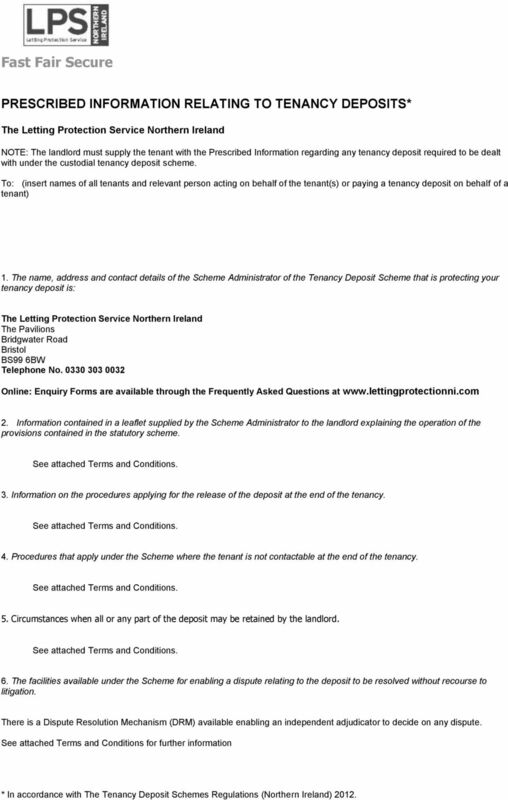 (insert amount of deposit paid; in the case of a joint tenancy it should be the total am"
1 13Fast Fair Secure PRESCRIBED INFORMATION RELATING TO TENANCY DEPOSITS* The Letting Protection Service Northern Ireland NOTE: The landlord must supply the tenant with the Prescribed Information regarding any tenancy deposit required to be dealt with under the custodial tenancy deposit scheme. To: (insert names of all tenants and relevant person acting on behalf of the tenant(s) or paying a tenancy deposit on behalf of a tenant) 1. The name, address and contact details of the Scheme Administrator of the Tenancy Deposit Scheme that is protecting your tenancy deposit is: The Letting Protection Service Northern Ireland The Pavilions Bridgwater Road Bristol BS99 6BW Telephone No Online: Enquiry Forms are available through the Frequently Asked Questions at 2. 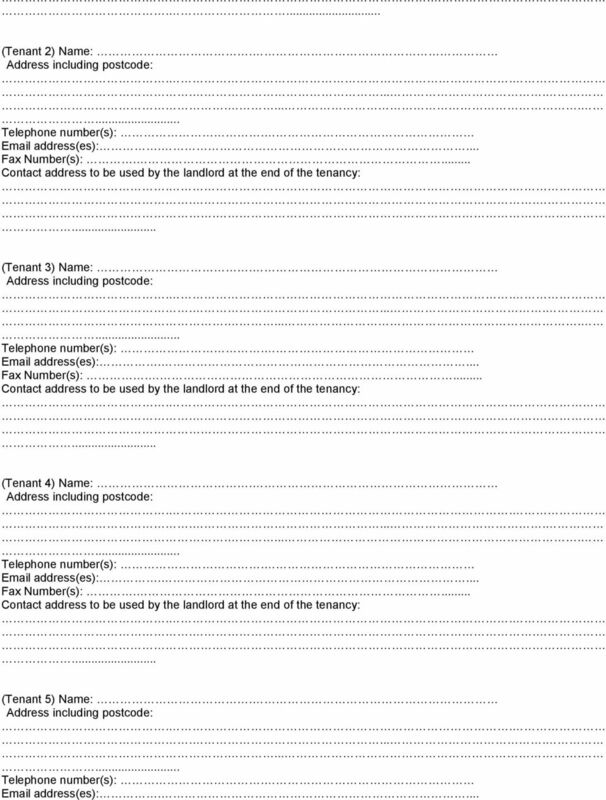 Information contained in a leaflet supplied by the Scheme Administrator to the landlord explaining the operation of the provisions contained in the statutory scheme. 3. Information on the procedures applying for the release of the deposit at the end of the tenancy. 4. Procedures that apply under the Scheme where the tenant is not contactable at the end of the tenancy. 5. Circumstances when all or any part of the deposit may be retained by the landlord. 6. The facilities available under the Scheme for enabling a dispute relating to the deposit to be resolved without recourse to litigation. There is a Dispute Resolution Mechanism (DRM) available enabling an independent adjudicator to decide on any dispute. See attached Terms and Conditions for further information * In accordance with The Tenancy Deposit Schemes Regulations (Northern Ireland) 2012. 5 13I/We (being the landlord/ letting agent) certify that ｨC (i) The information provided is accurate to the best of my/our knowledge and belief (ii) I/We have given the tenant(s) the opportunity to sign this document by way of confirmation that the information is accurate to the best of the tenant(s) knowledge and belief Landlord(s): Dated: Signature(s): Tenant(s): Dated: Signature(s): NOTES (1) A copy of The Letting Protection Service Northern Ireland Terms and Conditions must be attached to this document. It is available to download from (2) The tenant(s) and relevant persons (if any) agree that the lead tenant has been nominated by all the joint tenants and any relevant persons and that the responsibilities of the lead tenant are fully understood by all tenants. The responsibilities are detailed in Section 8 of the attached Terms and Conditions. 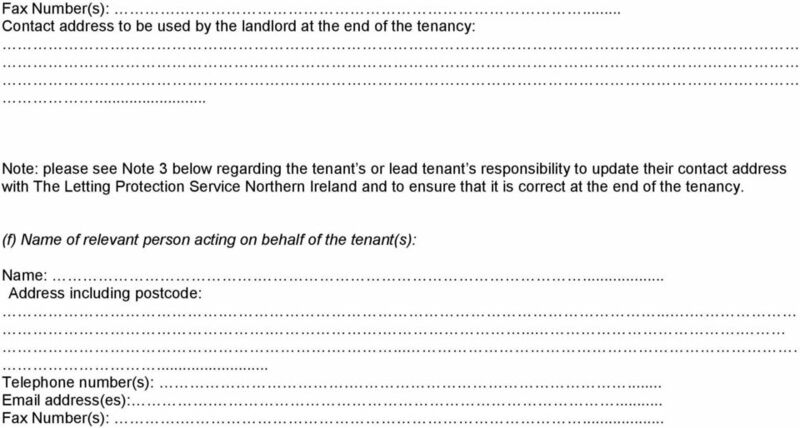 (3) It is the tenant ｯs or lead tenant ｯs (where relevant) responsibility to update their contact address with The Letting Protection Service Northern Ireland and to ensure that address is updated at the end of the tenancy. 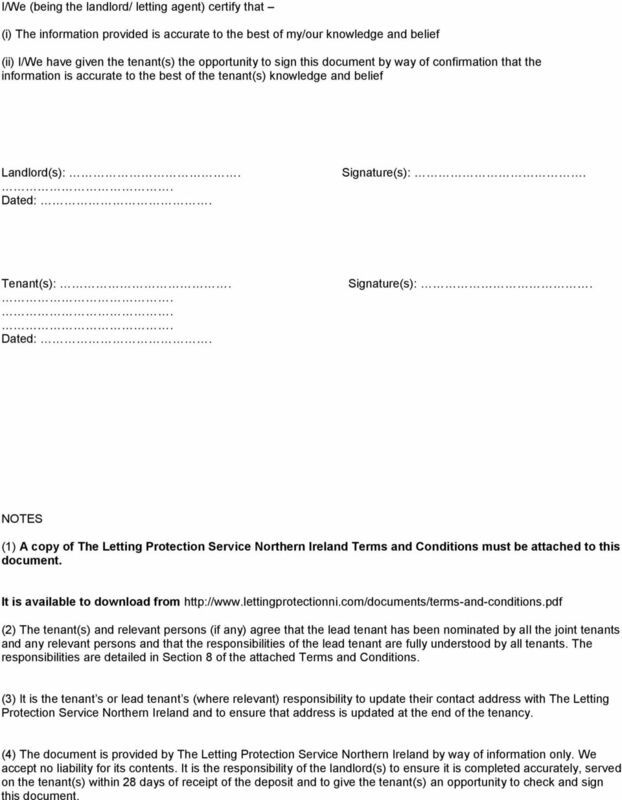 (4) The document is provided by The Letting Protection Service Northern Ireland by way of information only. We accept no liability for its contents. It is the responsibility of the landlord(s) to ensure it is completed accurately, served on the tenant(s) within 28 days of receipt of the deposit and to give the tenant(s) an opportunity to check and sign this document.